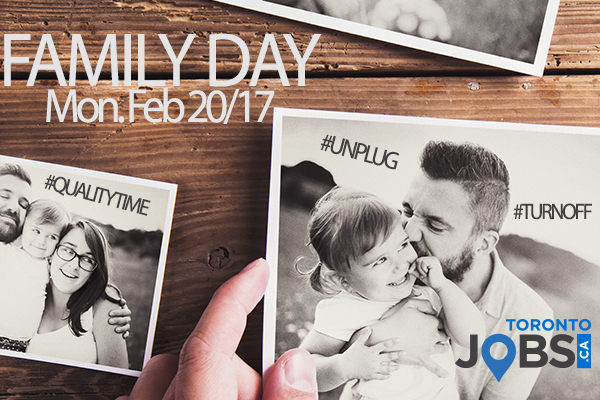 As we approach Family Day, it’s important to think about taking some time to unplug from work and focus on the important personal connections we have in our lives. Our work life seems to follow us everywhere with the evolution of smart phones, tablets and other technology advances. Employees now more than ever, feel the need to work harder and put in longer hours to keep up with the demand & expectations in the workplace. Plan ahead: You know that the short week is coming proceeding your day off. Work a bit harder the week before to ensure your tasks are complete and to ensure your mind is clear of larger work-load upon your return. Turn off your email notifications: Try scheduling in 1-2 hours during the day where you will check and respond to those emails that were of importance that day. Turning off your notifications will allow you to focus on what is happening around you with a clear mind and no distractions. Turn on your out-of-office: Ensure you have composed an out of office message that clearly states you will have delayed response times. You can also add in a line that lets them know a one hour window that you can be reached during working hours. Engage in activities: If you are like most of us, your brain never really shuts off with regards to your career. Try planning activities throughout the day that will keep your mind busy on other focuses. Leave your laptop at work: If you are having a tough time disconnecting, leave the thing that’s keeping you connected elsewhere. Turning off completely: Turning off your electronic devices completely allows you to focus on the moment and allows you to have control. This approach ensures no distractions, a clear mind and can even restore your focus once you plug back in. Try taking a break and see how it effects your production. You might be surprised with the outcome of shutting off and focusing on your personal connections and interests with no distraction. Happy Family Day from all of us at www.TorontoJobs.ca. Written by Rachel Mitchell, Manager, Business Development, TorontoJobs.ca. TorontoJobs.ca is a full-service recruitment organization, including TorontoJobs.ca Website, Career Fairs, full-service Recruitment Division and Outplacement Services. The local focus and advanced features make TorontoJobs.ca a vital asset for both job seekers and employers within the Greater Toronto Area. Visit our Online Career Centre for additional articles on Career Development, Personal Branding and more!